The goal is to supply the right amount of water at the right time to our plants in our gardens. Too much, and the plant suffers, too little, and the plant suffers. 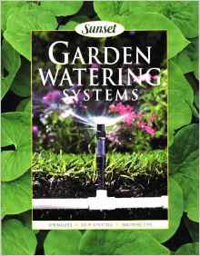 Gardening Watering Systems by Susan Lang may just be the book you are looking for. In this book she describes the pros and cons of sprinklers and drip systems, with plenty of water tips we all can use. This book of only 100 pages has the information we are looking for on watering systems, from basic components including portable sprinkler systems and soaker hoses to sophisticated underground sprinkler and drip strips. Ms. Lang provides much more than just the mechanics and operation of water systems. She includes a discussion or our soil’s composition and how that can impact irrigation; how to determine how much and how often we need to water our garden, trees and shrubs, and even our lawn. There is advice on understanding our water pressure, the flow of the water, and protecting against backflow; things we may have never thought about. Included is information of our water sources: wells, surface water, rain water, and the use of gray water. The last two chapters discuss watering to root depth, avoiding run-off, and the different watering needs of lawns, vegetable gardens, flower beds, ground covers, roses, native plants, seeds and seedlings, and potted plants. Included in this little book are photographs from over 40 photographers; all are worthy of this book. You can purchase this book thru online sources for as little as $1.99. You can’t go wrong, this will be a garden book that you refer to many times. This book was first published in 1999 by Sunset Books but it hits one of today’s hot garden topic: using our natural resources wisely.